It’s been almost 6 months I bought Instant Pot and I must say it is really helping me with its multipurpose uses. I can cook rice, steam Idlis, prepare Sambar, make the curd and many other uses which are making my Cooking easy. If you don’t know about Instant pot, let me give you a brief introduction. Instant Pot is similar to Pressure Cooker or I can say a modified version of Electric Cooker. Here you can find many buttons to choose based on your cooking requirement. I have been trying many Instant Pot recipes, mostly rice items. Since it is very quick to build pressure and I can keep the food warm as long as I want, I have almost forgotten my old Pressure cooker. Not only rice items, but I also have tried Stuffed Brinjal Curry which turned delicious. Also, there is a recipe book which has cake and other desserts using Instant Pot. Though I haven’t tried them I’m eager to explore more options using this wonderful kitchen gadget. 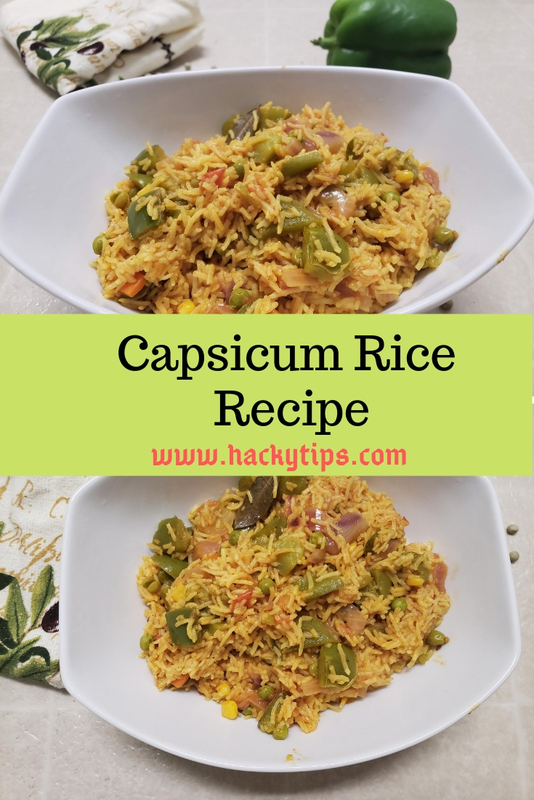 Today in this post, I’m going to provide Capsicum Rice Recipe. It is easy to prepare in Instant Pot and you can make it within 10 minutes. 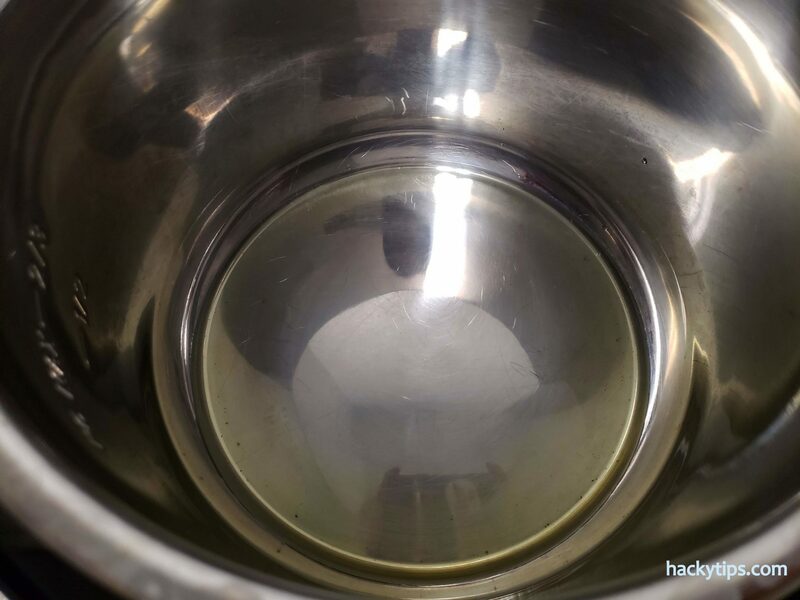 Take 2 cups of Rice in a bowl and wash thoroughly. Wash 2-3 times or until you see the clear water. Drain water and keep the rice side. 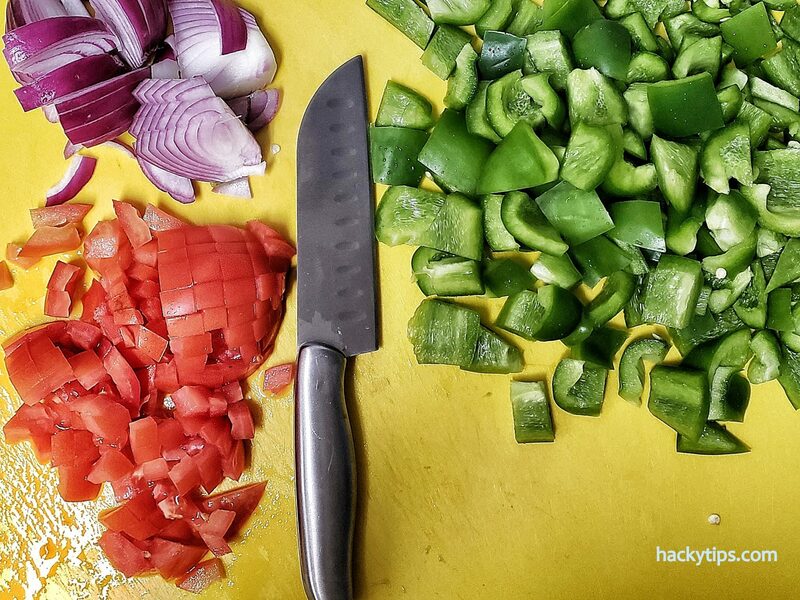 Chop Capsicum into small pieces, onion long sliced and tomatoes into small pieces. Turn on Instant Pot and set it for 8 minutes on Saute. Pour Olive oil into the pot and let it heat. Add Mustard seeds, Cumin seeds, Bay Leaf, & Cloves into the oil. 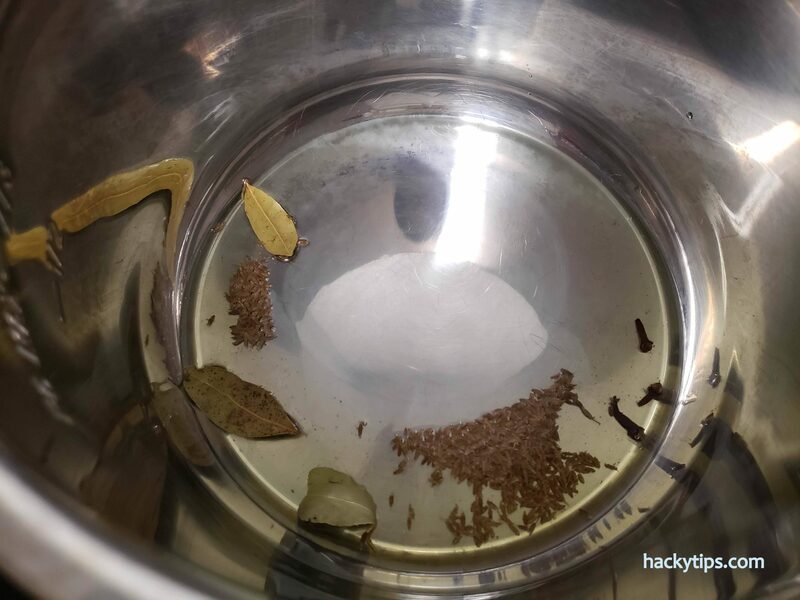 Generally, there won’t be a spluttering of mustard seeds in Instant Pot. Once you see the bubbles forming on mustard & cumin seeds then go ahead to add Onion. Fry until onion turns golden brown. Add tomatoes and saute very well. Once the tomatoes turn soft, add all the masala powders. Turmeric, Pulao masala, Chilli powder & Salt. 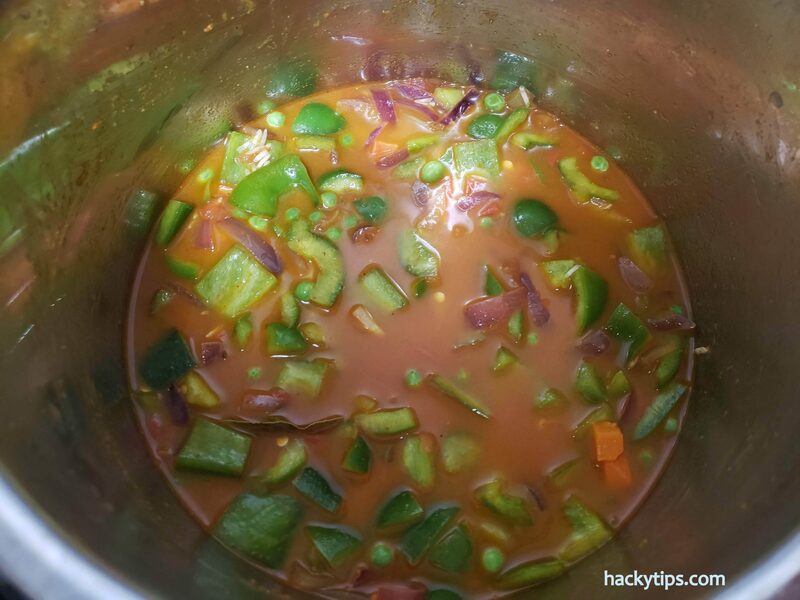 Add Capsicum and Peas into the Pot and mix thoroughly. You can close the lid and keep it for 2 minutes. 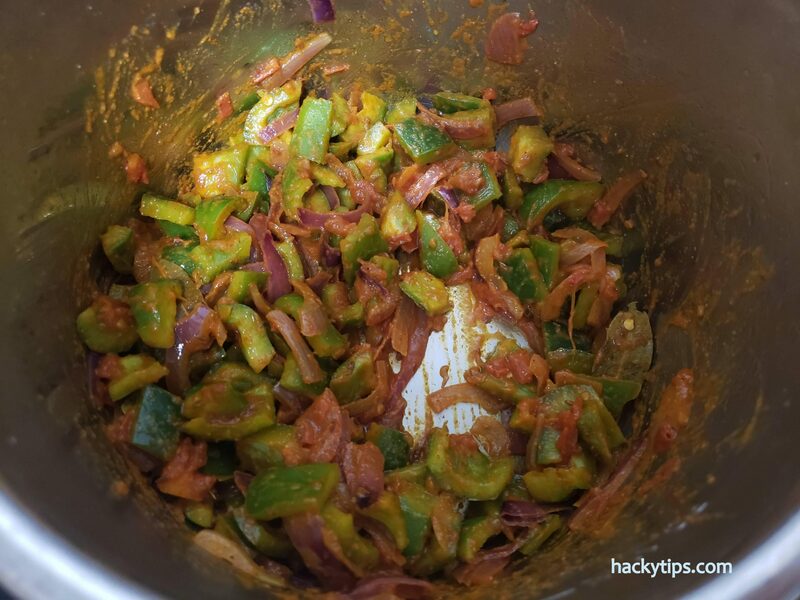 Since capsicum is going to boil along with Rice it is better if they are well fried with Masala. Otherwise, capsicum will be tasteless when the Rice is ready. Add 4 cups of Water (Depending on the quantity & type of your rice). Turn off the Instant Pot and reset it to Pressure Cooker for 2 minutes. Once the Pot beeps, wait until the pressure is gone or manually remove the pressure. Instant Pot capsicum Rice will be ready. 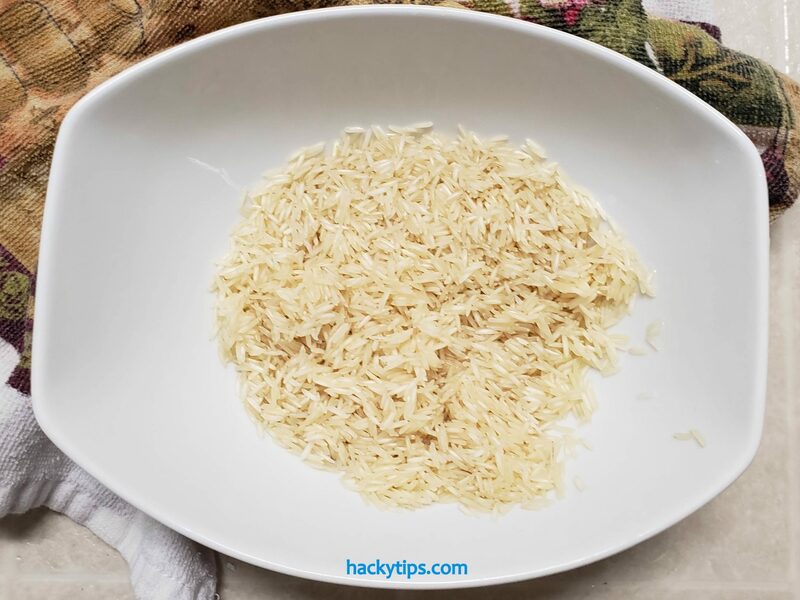 1) Wash rice thoroughly until the water runs clear. Drain the water and keep soaked rice aside. Store this Rice water to use it as a skin cleanser. Rice water exfoliates the skin, making it clear and glowing. 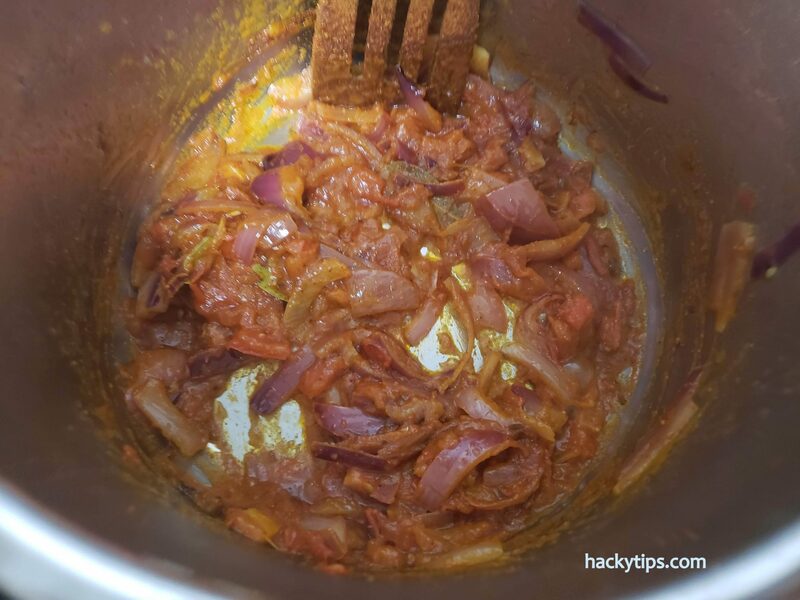 2) Chop Capsicum, Onion & Tomatoes as shown in the Picture. 3) Turn on Instant Pot and set it to Saute. I have set it for 8 minutes. 4) Pour olive oil into the Pot. 5) Add Bay leaves, Mustard seeds, cumin seeds & Clove into the hot oil. 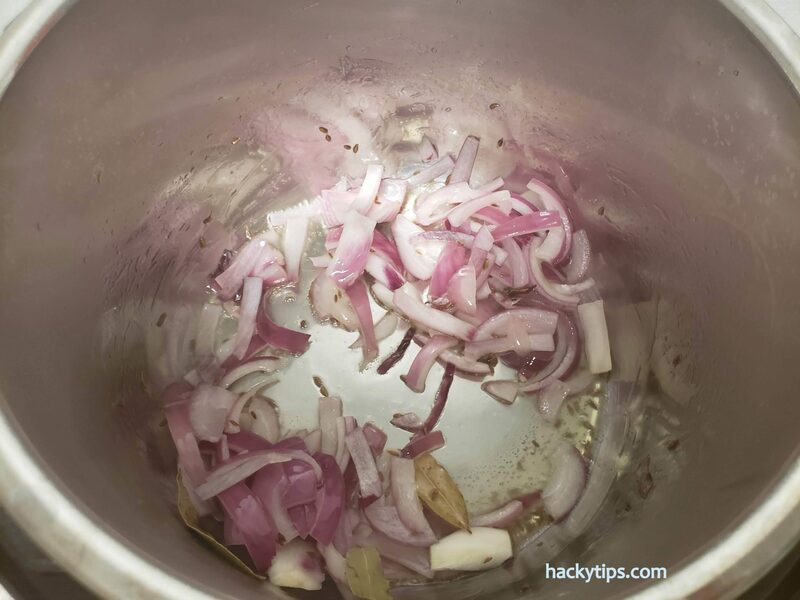 6) Once they are hot, add onions. 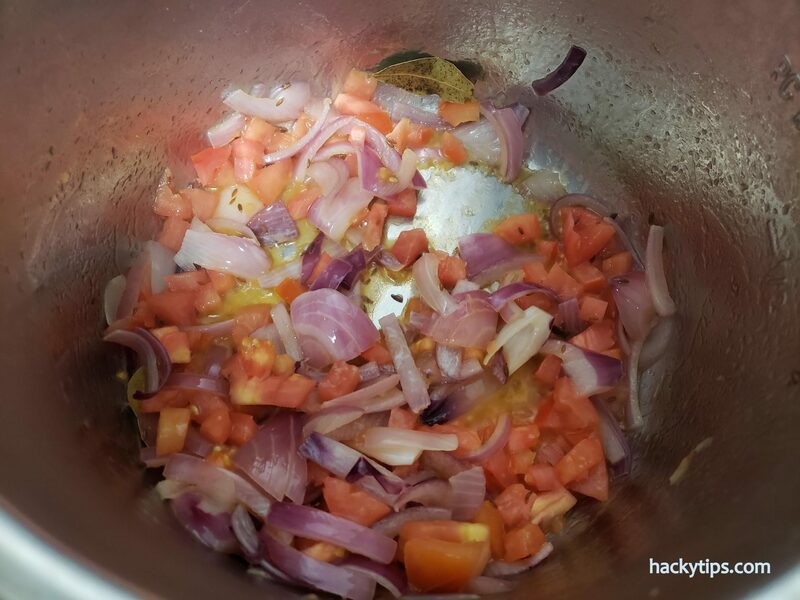 Fry until Onions turn golden brown and then add tomatoes. You can add Ginger-Garlic paste once after the onions for extra flavor. 7) Now it’s time to add Turmeric, Pulao Powder, Chilli Powder & Salt. I have used MTR Pulao Powder. You can either make at home or use readily available powder. 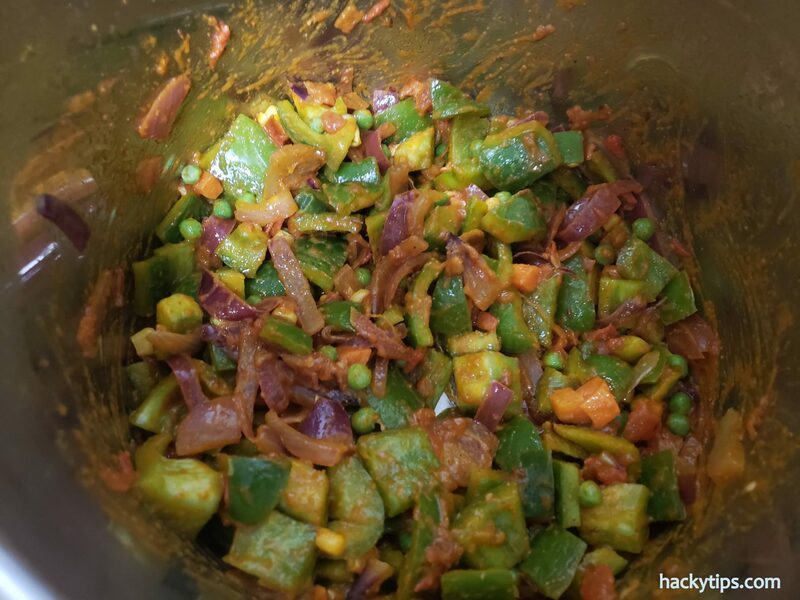 8) Mix Chopped Capsicum & Peas into the pot. 9) After a minute add soaked rice. Mix well and then add 4 cups of water. I have used Basumathi Rice in this recipe. Since it generally requires water less than any other rice type, I have added 3 1/2 cups of water. 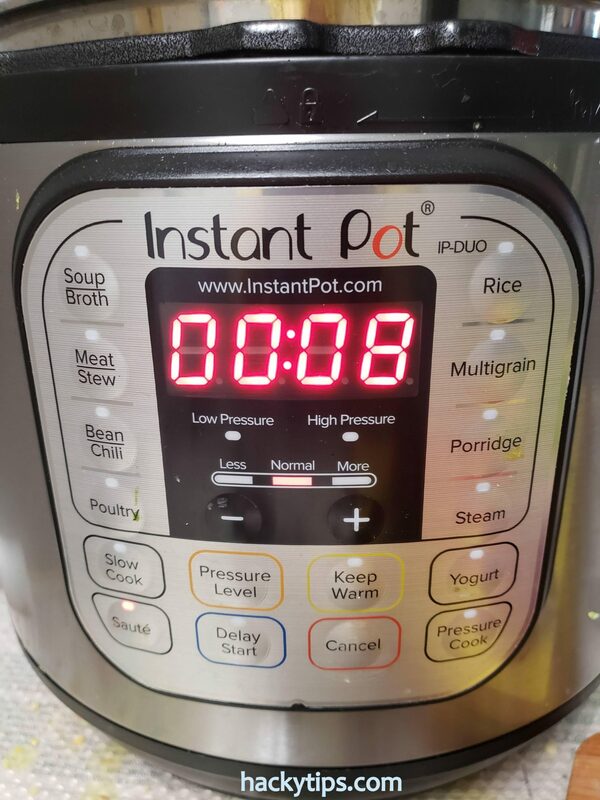 10) If it is 8 minutes already Instant Pot will automatically turn off. If not turn it off and reset it to Pressure cooker for 2 minutes. 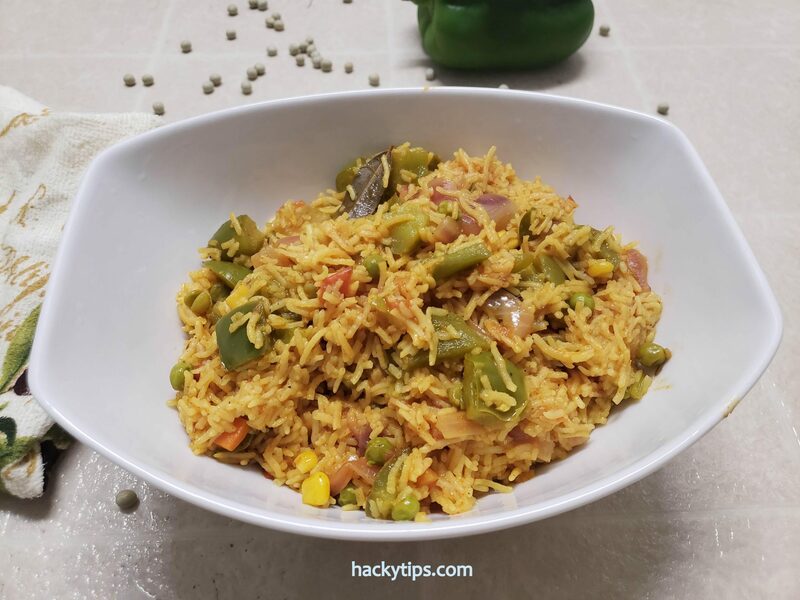 Serve hot Capsicum Rice along with Raita (Made of curd) for Lunch or Dinner. 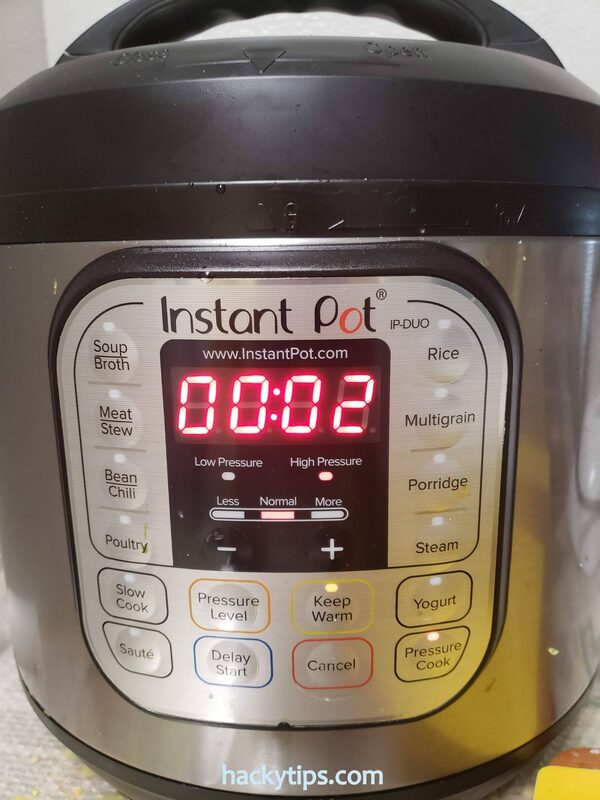 Do you use Instant Pot? What is your favorite Instant Pot recipe? This looks really good and easy to make. I haven’t invested in an instant pot yet, but am definitely considering it. Recipes like this are very helpful. Thanks for sharing! I have heard about a lot of people using the Instant Pot recently. Your recipe looks great and cooked in just 10 minutes is fantastic. Think it might be going on my wish list! Thank you! Yeah it is quick and easy. Especially with the Instant Pot. Looks yummy! I love Instant Pot recipes. I love my instapot! This recipe looks delicious and one that the whole family will love (picky eaters and all)! Haha 😀 Good to know that you use Instant Pot. I have never used instant pot neither do I have one. But I do have and use pressure cooker and from the function you described, I think it’s nearly the same thing except for a few features. I should get one since I dislike cooking(mostly spending long hours trying to prepare a meal). I do love your recipe. This is the digitalized version of Pressure Cooker. Comes with lot many buttons and benefits! Oh gosh. Yummy! Gotta love that! I would surely try that out. That sounds so absolutely delicious! 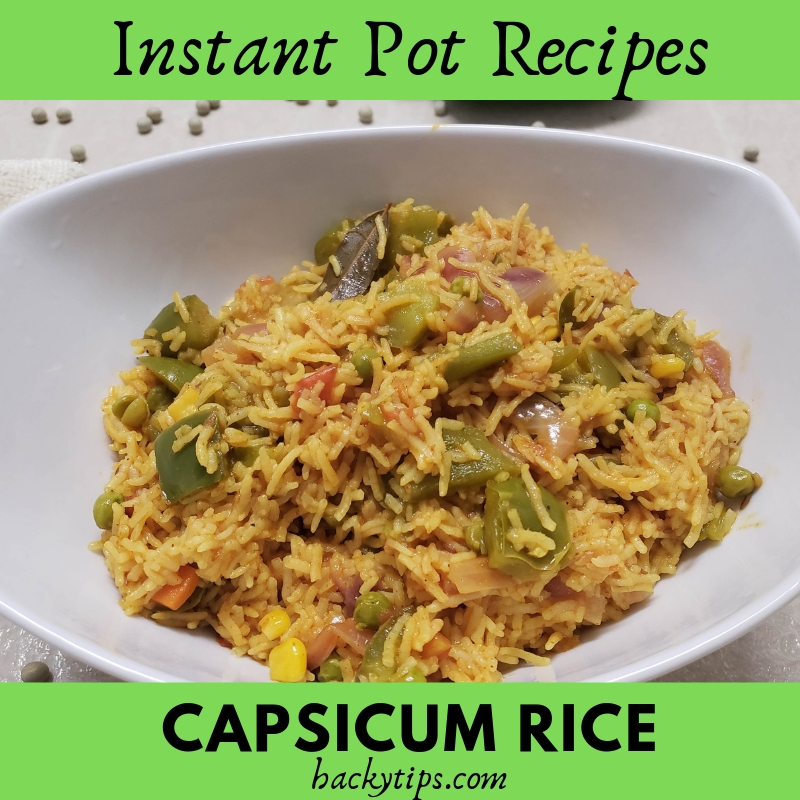 I would love to try your Instant Pot Recipes for Capsicum Rice. I bet it would be super delicious. This looks delicious! I may have to try this recipe soon! Wow your instructional recipe is so good and easy to prepare! I want this to try as well to my cooker. You can. This works well with a normal pressure cooker. It just takes a little more time. This looks delicious. I’m not the biggest fan of rice but this looks lovely and I definitely want to try it. The pics are awesome. Hope it tastes as good as it looks. I will suggest the recipe to my friends and family. Thanks for sharing. 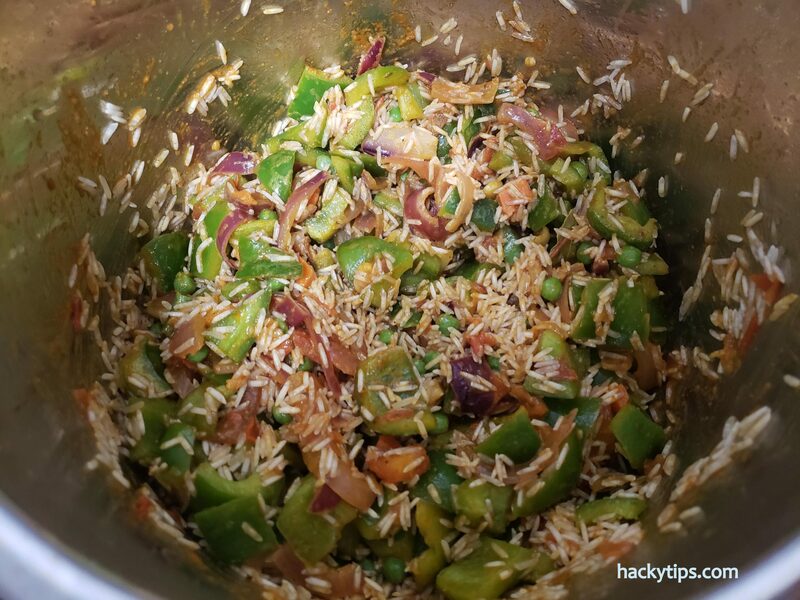 Thanks for this Instant Pot capsicum Rice recipe. I would love to try it with my family. So many people seem to be getting an instant pot/slow cooker these days. Making food like this you’ve made me want one even more now! I know! Instant Pot is the latest trend in the Kitchen market.